The grid isn't broken, but it needs to be hardened. How best to do it? When operators of Duke Energy's control room in Raleigh, North Carolina wait for a hurricane, the mood is often calm in the hours leading up to the storm. Then begins a “frenzied pace” that can last for days — like when Hurricane Florence parked over Duke’s service territory in September. When an event like Florence hits, all eyes are on transmission and distribution. Where it’s available, Duke uses remote switching to reconnect customers quickly. As outages mount, the utility forecasts and balances its generation with electricity demand. The control center’s four to six operators work 12-hour shifts, while nearby staff members field thousands of calls and alarms on the system. After it’s over, “we still hold our breath a little bit to make sure we’ve operated everything correctly,” said Goettsch. Damage assessment and rebuilding can only begin once a storm passes. That cycle is becoming increasingly common in utility service areas like Duke's. A slate of natural disasters that reads like a roll call — Willa, Michael, Harvey, Irma, Maria, Florence and Thomas — has forced a serious conversation about resiliency. And though Goettsch has heard a lot about resiliency as a “hot topic” at industry events and meetings, those conversations are only now entering Duke’s control room. Resilience discussions come and go in the energy industry. Storms like Hurricane Sandy and Matthew can spur a nationwide focus on resiliency, but change is largely concentrated in local areas that experienced the disaster. After a few news cycles, the topic fades into the background. However, experts agree that resilience is becoming much more important to year-round utility planning and operations. It's not a fad. Can renewables meet the challenge? After Hurricane Florence, The Intercept reported on coal ash basins washed out by the storm’s overwhelming waters. In advance of that storm, Duke shut down one nuclear plant to protect it from high winds. The Washington Post also recently reported on a slowly leaking oil spill, which could surpass Deepwater Horizon in size, caused by Hurricane Ivan in 2004. Clean energy boosters have seized on those vulnerabilities.They say solar and wind, which don’t rely on access to fuel and can often generate power immediately after a storm, provide resilience that other electricity sources do not. Duke, however, dismissed the notion that one generation type could beat out another in a serious storm. In regard to performance, Wade Schauer, director of Americas Power & Renewables Research at Wood Mackenzie, said the situation is “complex.” According to him, output of solar and wind during a storm depends heavily on the event and its location. While comprehensive data on generation performance is sparse, Schauer said coal and gas generators could experience outages at 25 percent while stormy weather might cut 95 percent of output from renewables. Ahead of last year’s “bomb cyclone” in New England, WoodMac data shows that wind dropped to less than 1 percent of the supply mix. “When it comes to resiliency, ‘average performance’ doesn't cut it,” said Schauer. In the future, he said high winds could impact all U.S. offshore wind farms, since projects are slated for a small geographic area in the Northeast. He also pointed to anecdotal instances of solar arrays in New England taken out by feet of snow. During Florence, North Carolina’s wind farms escaped the highest winds and continued producing electricity throughout. Cloud cover, on the other hand, pushed solar production below average levels. After Florence passed, Duke reported that most of its solar came online quickly, although four of its utility-owned facilities remained offline for weeks afterward. Only one was because of damage; the other three remained offline due to substation interconnection issues. According to installer reports, solar systems fared relatively well in recent storms. But the industry has also highlighted potential improvements. Following Hurricanes Maria and Irma, the Federal Emergency Management Agency published guidelines for installing and maintaining storm-resistant solar arrays. The document recommended steps such as annual checks for bolt tightness and using microinverters rather than string inverters. Rocky Mountain Institute (RMI) also assembled a guide for retrofitting and constructing new installations. It described attributes of solar systems that survived storms, like lateral racking supports, and those that failed, like undersized and under-torqued bolts. Advocates believe wind, solar, batteries and microgrids offer the most promise because they often rely less on transmitting electricity long distances. Distributed renewables harden a system because they can supply power from shorter distances, lessening reliance on wires. Utilities are hesitant to ditch fossil fuel generation based on resiliency alone. But they do agree that the grid needs hardening. 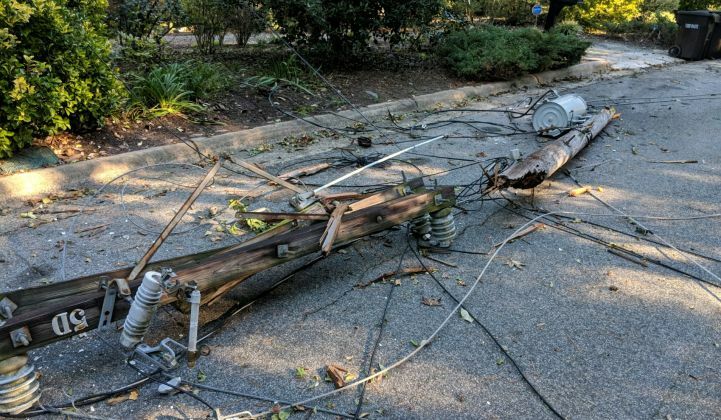 Duke has formed a “Smart-Thinking Grid” plan that aims to reduce customers impacted by outages by up to 75 percent. According to the utility, portions of the plan already in place helped avoid over 80,000 extended outages during Florence. Still, nine Duke substations flooded during the storm. 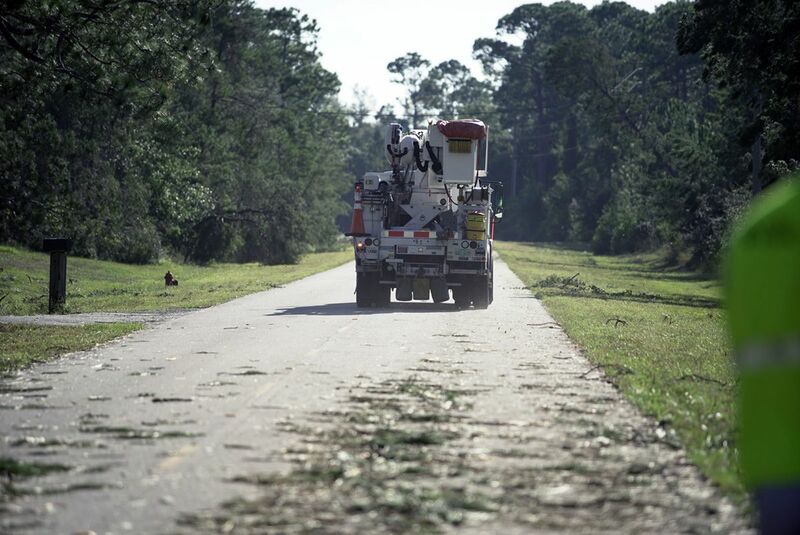 The utility experienced over 1 million outages in North and South Carolina. The hit from Hurricane Michael, just weeks later, impacted over 1 million people in the Carolinas and over 75,000 in Florida. Brooks said Duke is investing in battery technologies and research to store energy from a diversified energy mix and dispatch clean energy where it’s needed. The utility is also considering microgrids as a solution to avoid building transmission and distribution lines in certain areas. 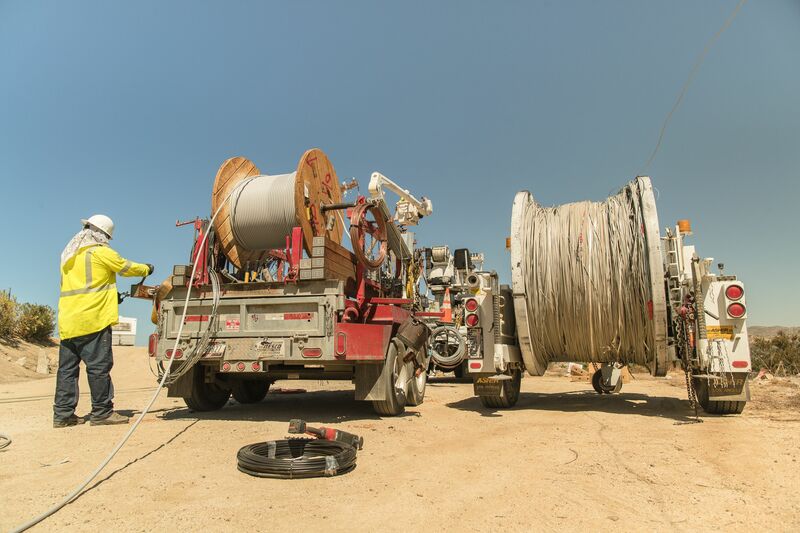 Improvements in mobile communications and data analysis also allow Duke to handle problems remotely or assess where undergrounding is most beneficial. California utilities deal with a different but equally timely challenge: increasing and more severe wildfires. The state is currently gripped by a devastating wildfire that killed 23 people and displaced 300,000 more. 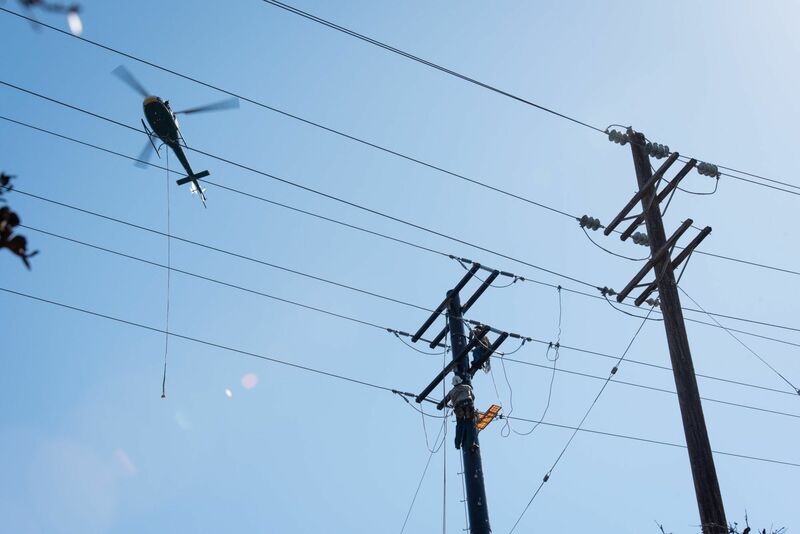 Brian Chen, principal manager for grid resiliency and safety at Southern California Edison, said the utility now deals with the near-constant threat of blazes. In September, SCE announced plans to invest $582 million in hardening over the next several years. The plan awaits approval, but the utility is already deploying parts of the program because the situation is so severe. 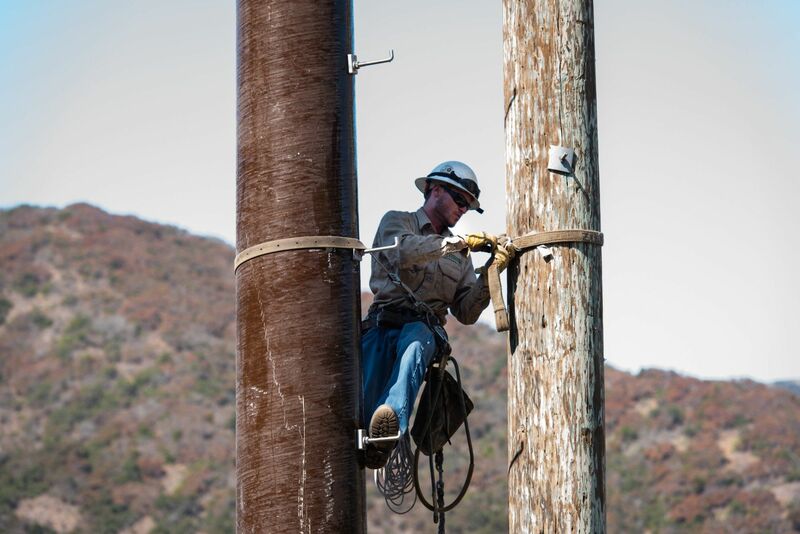 SCE will install composite poles to replace wood poles in some areas that experience wildfires. Credit: Southern California Edison. Chen said the utility attacks the problem in two ways: preventing faults and fires ahead of time, and containing them quickly when they do happen. For utilities, it's about both protecting customers and protecting the entire business. SCE is currently facing lawsuits related to the late-2017 Thomas fire, and recently admitted its equipment deserved some blame. Other California utilities such as Pacific Gas & Electric also face fire-related legal challenges. SCE will roll out weather forecasting stations, high-definition cameras and overhead infrared scanning technologies to identify potential system hotspots. Chen said the utility will also beef up a vegetation management program and replace bare conductors on 600 miles of service line with covered conductors that have insulated wires. The installation of 15,700 current-limiting fuses will more quickly interrupt currents and segment circuits, while new recloser technology can keep a circuit from re-energizing so the utility can perform inspection. SCE also maintains an emergency option: shutting off the power during extreme fire conditions. As part of that shutoff plan, SCE pitched “portable community power trailers” that use renewable generation and energy storage to provide temporary power to customers. Pacific Gas & Electric recently cut power in several Northern California counties as a “last-resort” measure to protect against wildfire. The plans indicate the changing (albeit slowly) attitudes of regulated utilities in determining goals and requirements for delivering power. “The business model of the utility is being disrupted,” said Don Wingate, vice president of strategic customers and microgrid solutions at Schneider Electric. Many technologies now getting attention, like microgrids, aren’t new. But Wingate said legacy companies are beginning to seriously consider their implications. Ben Kellison, WoodMac’s director of grid research, said a grid with non-wires alternatives, local microgrids and distributed energy resources networked together is a possibility, but far from current reality. He called DER aggregation “a holy grail for utilities” in increasing resilience. Utilities say they are taking a holistic approach that will incorporate a wide range of technologies and grid-management practices. For many, those improvements can’t come fast enough. Over the years, “energy network of things” provider Blue Pillar has focused on connecting energy infrastructure for customers, including hospitals, universities and military bases. Blue Pillar's commercial and industrial customers want more control of energy data to avoid catastrophic failure during a utility outage. In the last 24 months, CEO Tom Willie said he’s seen an uptick in customers looking for those applications. 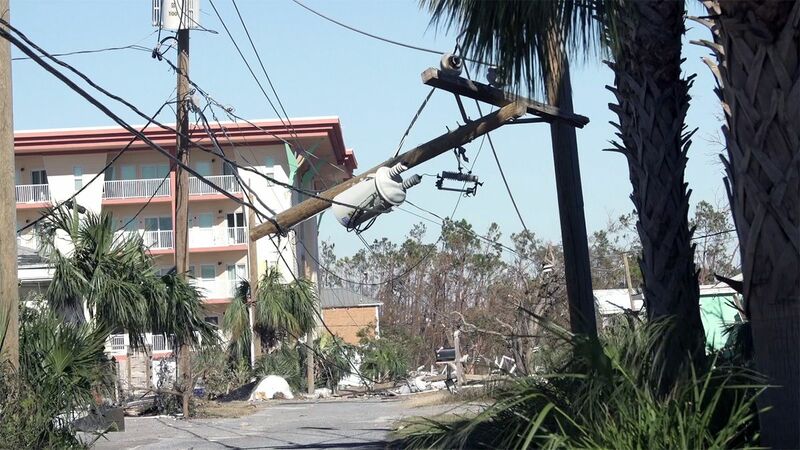 In certain areas of Florida impacted by Hurricane Michael, over 80 percent of people lost power. Credit: Duke Energy. Lisa Laughner, president and CEO at microgrid company Go Electric, said 2018 has been the company’s biggest year for resilience-related customer inquiries. Go Electric provides uninterruptible power supplies using distributed resources. Laughner said smaller, nimbler companies can often meet the challenge easier than utilities. “It’s the stereotypical thing about startups versus large corporates,” she said. “We can move fast, we think differently, we don’t bring the corporate baggage to the table." Adam Freed, principal in sustainability at Bloomberg Associates, said utilities must figure out how to match that pace of change. He pointed to Consolidated Edison’s investment of $200 million in non-wires alternatives, instead of a $1.2 billion substation, as an indication that traditional companies are beginning to reconsider their role. But it’s happening slowly. Though costs have fallen dramatically for resilience-related technologies like energy storage and microgrids, utilities still put extreme emphasis on providing cheap power. Expensive lawsuits, like those facing PG&E and SCE due to fire damage, may push them to rethink the equation. “The problem with resiliency is it's very hard to economically quantify. It’s kind of like, why do you buy AAA for your car?” said Blue Pillar's Willie. Some service providers, such as AES, Shell and Centrica, are starting to understand the economics of resilience and take advantage of customer interest to make money, said Willie. Large, regulated utilities are next. For service providers with big balance sheets, waiting to invest in new technologies may not hurt business in the long run. They can play catch-up through acquisitions. Laughner said she’s already seen an uptick in mergers and acquisitions over the past year. But regulated utilities don’t have that luxury. We can't get to much higher levels of reliability “without exceptional tolerance for increased capital spend,” said WoodMac’s Kellison. In the meantime, smaller energy providers are finding new ways to help customers after disasters. In Puerto Rico after Hurricane Maria, for example, federal recovery arrived at a painfully slow pace. Private companies outmaneuvered the government and deployed storage systems and solar arrays. “The ability to react fast is something private companies can do much faster than governments,” said Levy. Resilience has become a top concern among policymakers. Last year, the concept worked its way to the highest rungs of government as the Department of Energy (DOE) and the White House considered lifesaving support for coal and nuclear plants. Career staff are quietly working on the topic as well. A year before the 2016 election, DOE established its Partnership for Energy Sector Climate Resilience, which joined utilities across the country in developing and sharing resilience initiatives. The agency followed that effort with a $220 million, multi-year grid modernization program that brought utilities, vendors, national labs, and regulators together. More recently, Energy Secretary Rick Perry created the Office of Cybersecurity, Energy Security and Emergency Response with $96 million in funding. It’s designed to prepare the grid for both natural and manmade threats. After a storm, it's often the poles and wires that need to be fixed. Credit: Southern California Edison. Hawaii, with its advanced vision for a clean grid, has been a base for much of DOE’s work with solar-plus-storage and renewables grid integration. Charlie Gay, director of DOE’s solar energy technologies office, said lessons learned there could translate to Puerto Rico, and eventually to the rest of the country. “There’s a good long-term vision for the role of microgrids, bringing greater resilience, linking into both the distributed generation and the cybersecurity that can come with this,” said Gay. While tools like HOMER, which grew out of work at the National Renewable Energy Laboratory, have been used for years, newer applications like Sandia’s Microgrid Design Toolkit could add transparency and opportunities to cut costs. Still, there’s plenty of conflict over what a resilient energy system should look like. The controversy over the Trump Administration's attempts to bail out coal and nuclear plants in the name of resiliency shows how contentious the subject can be at the national level. Now many local and state governments are taking active steps to tackle it on their own. In 2015, San Francisco received a SunShot grant to expand testing of solar-plus-storage for resilience applications. When the program winds down at the end of the year, the city will have an open-source solar-plus-storage sizing tool and a dollar-value calculation for resiliency, which could help developers factor it into the economics of projects. When the city originally assessed the cost of solar-plus-storage compared to cheap hydro power, it didn’t quite pencil out. Including a resilience value — akin to the Obama administration’s social cost of carbon — could help decision-makers better evaluate investments. “What is the value of resiliency? Nobody has really come up with a dollar value. Driving decision-making around this is really something more than just economics," said Jessie Denver, the energy program manager for San Francisco. State policy, in turn, helped San Francisco. California recently passed legislation that requires 100 percent zero-carbon energy by 2045, and sets out transparent rules for microgrids. This year Hawaii, too, passed legislation designed to support resilience-related microgrid development. The state also has a 100 percent clean energy goal by 2045. Those trends are working their way into less energy-progressive states, as well. In March, Colorado passed legislation allowing utility customers to install energy storage. Alabama Power’s recent request for proposals includes storage. Ohio’s PowerForward initiative and the Future Energy Jobs Act in Illinois are more examples.